TOUCH Women's collection offers the softest compression sock available. 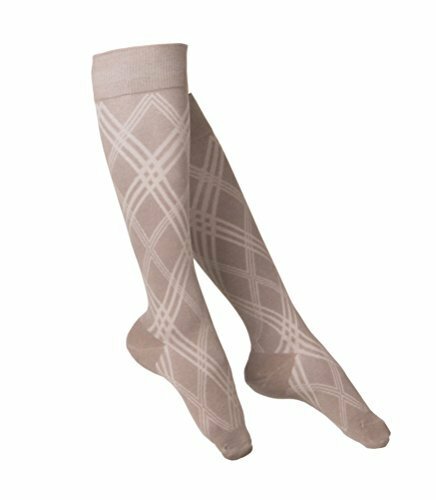 Knee high ladies fashion socks with 15-20 mmHg graduated compression. This means that the pressure is greatest at the ankle, and decreases gradually up the leg. The level of compression is expressed as mmHg (millimeters of mercury), which is a common measurement of pressure. This moderate pressure helps keep legs energized throughout the day. The continued wear of Touch compression socks can help with the following: Relieving leg fatigue, ease swelling, promoting healthy circulation, concealing unsightly leg blemishes. TOUCH compression socks invigorate legs during extended periods of sitting or standing as well as when travelling. All Touch products are truly designed with your ultimate comfort in mind, and are appropriate for men of any age. Touch knee high socks stay comfortably in place throughout the day and are made with luxuriously soft combed cotton. Four sleek patterns offer a crisp design that will match any outfit. Whether it is a formal busines meeting or a gathering with friends, these timeless patterns will be your go to pair for years to come. TOUCH compression socks are knit with luxuriously soft therapeutic combed cotton to massage tired legs, ease swelling, and comfort your feet. These stylish socks feature Graduated Compression Technology, which is greatest at the ankle and decreases gradually up the leg to promote healthy circulation and keep you feeling energized. a stylish, comfortable way to provide relief for varicose veins, spider veins, conditions associated with diabetes, and promotes positive blood-flow during flight or long periods of sitting or standing. A smooth, non-slip, comfortable top provides a fit that is both flexible and snug without an uncomfortable bind. Knit-in, reinforced heel pocket is defined and added for long-term durability, comfort, and proper fit. Seamless toe box with hand-linked seam for greater comfort and less friction and abrasion. Measure ankle and calf dimensions first, then use shoe size. Available Sizes: Small (5-7), Medium (7.5-9.5), and Large (10-12). If you have any questions about this product by TOUCH Compression, contact us by completing and submitting the form below. If you are looking for a specif part number, please include it with your message.